Barcelona coach Ernesto Valverde doesn't give much importance to the fact the amount of players from the club in the Spain team has fallen. 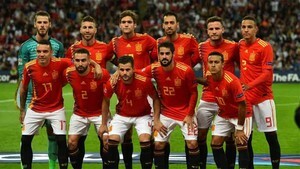 Sergio Busquets was the only Barça player to start Spain's wins over England and Croatia, while the amount of Real Madrid players in La Roja has grown. "I don’t think it’s worrying," Valverde said about the change. "I think you have to know how to read things. Just like a while ago there were more Barcelona players, now there are more from Madrid. "There are players that are no longer there, like Andres (Iniesta), (Gerard) Pique, Jordi Alba&mldr; It is true that Madrid have signed players in recent years with Spain aspirations: (Marco) Asensio, Isco, (Dani) Ceballos &mldr; but if you look at players from Madrid’s academy and from Barca’s (in the squad), it’s similar, I think. Anyway, we will fight to change that and hopefully more of our players can be called up. " On the flip side, Valverde is delighted that players like Pique, Alba and Lionel Messi have had a good rest over the international break due to not joining up with their countries. "The fact that we have players that not had that wear and tear, like Pique, Messi and Alba, is something that I have in mind," he added. "It’s better for us, I am not going to lie."